Plymouth and Valiant don’t just stand there. Plymouth owners like the things Plymouth does. They like the way a Plymouth Fury won 8 of 10 events from a Ford Galaxie 500 and a Chevrolet Impala V-8 in a test made at Plymouth’s request my nationwide Consumer Testing Institute. You’ll like Plymouth. the car that does everything… beautifully. Plymouth’s on the move! Valiant is the best all-around compact anybody has come up with yet! 3600 drivers tested leading compacts under supervision of the same testing company. 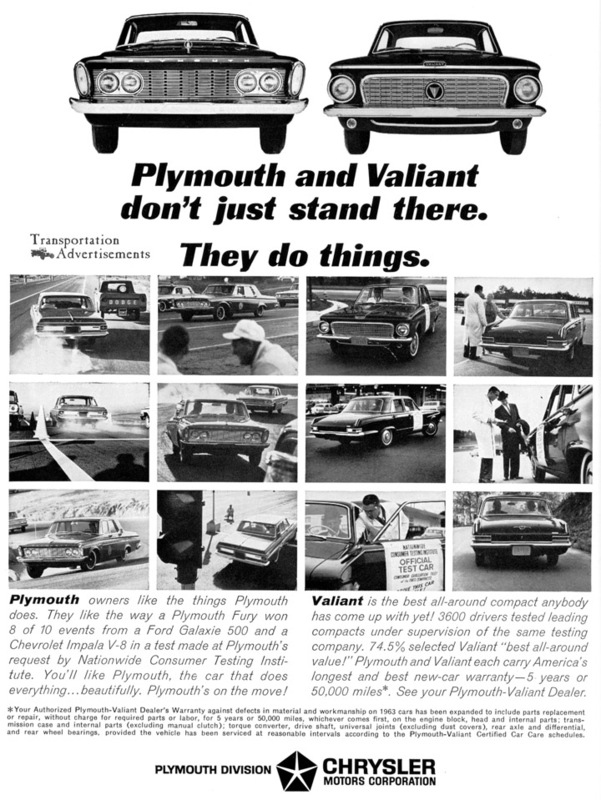 74.5% selected Valiant “best all-around value!” Plymouth and Valiant each carry America’s longest and best new-car warranty – 5 years or 50,000 miles* See your Plymouth-Valiant Dealer. * Your Authorized Plymouth-Valiant Dealer’s Warranty against defects in material and workmanship on 1963 cars has been expanded to include replacement or repairs, without charge for required parts or labor, for 5 years or 50,000 miles, whichever comes first, on the engine block, head and internal parts; transmission case and internal parts (excluding manual clutch); torque converter, drive shaft, universal joints (excluding dust covers), rear axle and differential, and rear wheel bearings, provided the vehicle has been serviced at reasonable intervals according to the Plymouth-Valiant Certified Car Care schedules. Transportation Advertisements is powered by	WordPress 5.0.4 and delivered to you in 0.507 seconds using 31 queries.